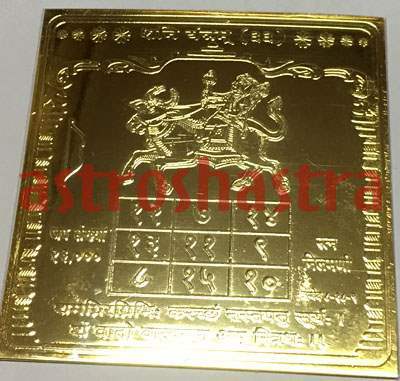 Shani/Saturn Yantra	to Propitiate an afflicted Sani and achieve Rajayog. It represents discipline, system, order, diligence, prudence, discretion, persistence, obedience and faithfuhless. Saturn when posited in Gemini, Virgo, Taurus and Libra is termed to be in his friendly Rasis but in other Rasis he is termed to be in enemy’s camp. Constellations ruled by Saturn are Pushyami, Anuradha and Uttrabhadra. Saturn is friendly to Venus and Mercury, neutral to Jupiter and enemy to Sun, Moon and Mars. Saturn gets directional strength and digbala in Libra. It is barren, binding, cold, earthy and masucline. It is a planet of nervousness and secrets. Packet contains : Yantra , Roli , Mouli. It is used to pacify an afflicted Sani or Saturn and achieve Rajayoga through complete blessings of Sani. When Saturn is malefic in a horoscope, in transit or causes Sadesati, use of it is very beneficial. Saturn is considered the significator of iron, buffalo, oil, sesame, salt, sapphire, cremation ground, black colour. Disease such as sciatica, skin related , Asthma, leprosy are due to malefic position of Saturn. This Yantra is very effective for those suffereing from these ailments. It is useful, when one feels depressed. It indicates sucess in wordly affairs, success in business and the man touches the dizzy heights. It is embossed on copper plate and is kept on rising moon Saturday during venus or Saturn Hora. 1. 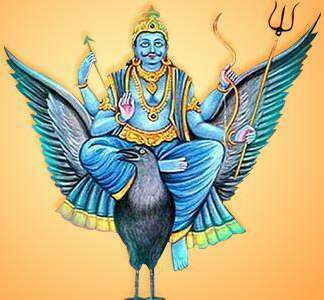 It is very effective remedy for Shani Sade Satti , Shani Mahadasa. 2. It	give	endurance	,	Power	and	Strength. 3. Makes ones thinking Rationale. 4. Balances the Mooladhara Chakra. 5. Give immense wealth and Properties. "Om Preeng Proong sa Shanye namah"